Art 8 is an introductory course that focuses on discovering the magic found in mixing the paints of the colour wheel, creating fun hand built clay projects, general design and drawing skills. Participation in Art 8 gives the student “a taste” of some of the basic skills of art and design, which will help students enjoy making and/or appreciating art in the future. ​Students should anticipate spending additional time outside of classroom sessions to complete the work assigned. Studio is open lunch and after school daily (unless otherwise posted). 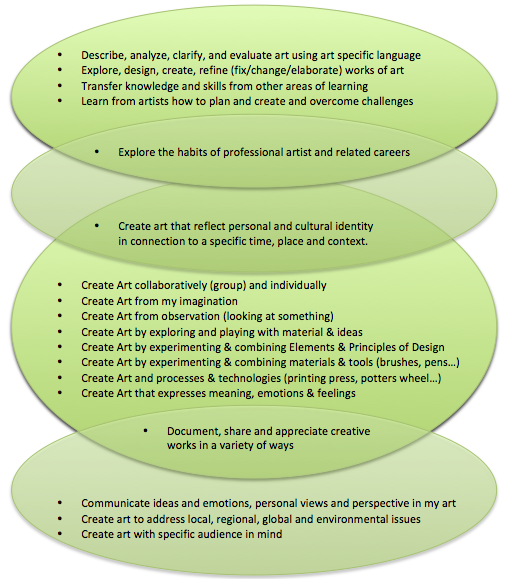 Students are responsible for planning and creating work to satisfy the curricular competencies. Brainstorming, preliminary drawings and image collection that demonstrate thinking process and development of ideas. 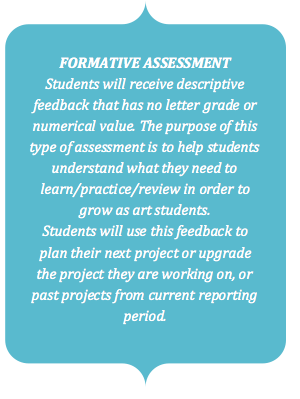 Students maybe assigned daily or weekly sketchbook assignments throughout the semester. Participate in class critiques. Students can post their progress, assignments, finished product or any artwork of their choosing on social media (#salishvisualart #salishart8 #surreysharesart). Weekly documentation of work using Fresh Grade. Students are to complete weekly reflections on FreshGrade. BE ON TIME! There will be consequences for students who have unexcused lates and absences. IF AWAY, students must make up missed work. Classroom is open at lunch and after school. Visit the class website for missed lessons and sketchbook assignments. NO FOOD or beverages (unless it has a lid) in the classroom. Bring your supplies, be prepared to work at the start of class and do your BEST! No use of others ideas, images, paintings or drawings as they are already the creation/idea of another artist. The use of other people’s work is PLAGIARISM! BE RESPECTFUL (of yourself and others) and clean-up after yourself! Don't touch others projects or supplies without permission. Only reason to be using technology in the classroom is for research and FreshGrade. Please download the FreshGrade Student app. ABSOLUTELY NO CELL PHONES OR PERSONAL MUSIC DEVICES in the classroom unless with teacher permission. If such devices (including EAR PHONES) are displayed, students will be asked to keep cellphones in bag or faced down on tables. Only reason to be using technology in the classroom is for research and FreshGrade. ​MUST BRING ART SUPPLIES (items with an asterisk*) to EVERY class… NO EXCEPTIONS!! *Pencil (HB, 2B, 5B), *eraser, *sketchbook, *fine tip black felt pen, pencil crayons (Crayola pencil crayons are a good option for beginners. Prisma pencil crayons are recommend for more advanced students). Ruler, Glue Stick and acrylic paint brushes (students who don’t choose to purchase their own brushes will share the class set).